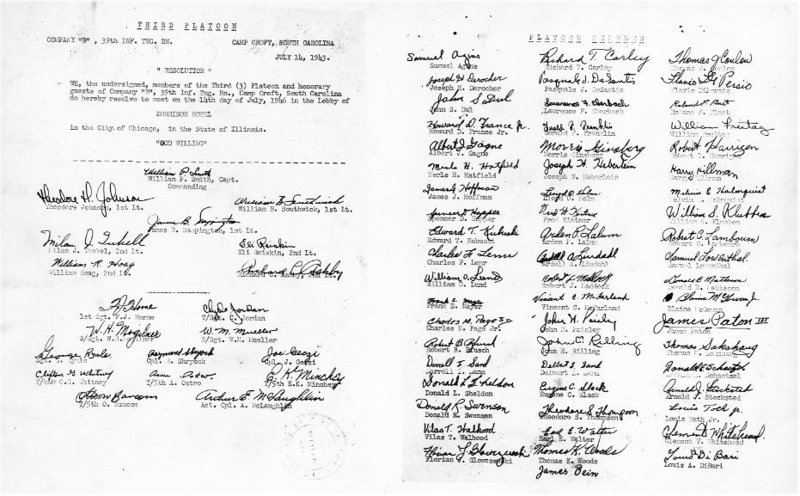 Joe Geczi was inducted from Local Board 11 (Trenton, New Jersey) on April 18, 1941 at the age of 21. After being sworn in, he and two friends, Carmen Fascinella and Johnny Lesso, joined the ranks of the United States Army and were sent via rail to the Fort Dix, 1229th Reception Center. The story continues with Joe's recollections in italics, taken from his many journals. 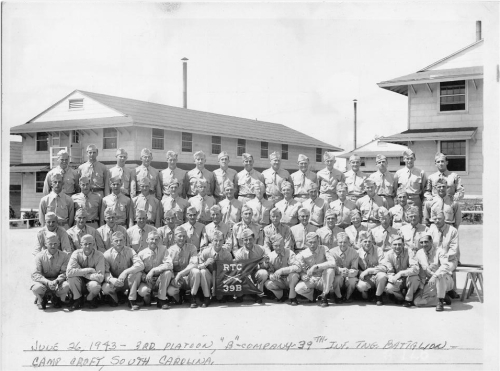 "We left there and arrived at Camp Croft, South Carolina for Infantry Basic Training on April 25, 1941. Had a rough 13 weeks but managed to stay there as part of the Training Cadre. I took 13 weeks of basic military training (infantry) in Company A, 39th Infantry Training Battalion. Lt. Col. Roger Hillsman was our Battalion Commading Officer. I was promoted to Cadre NCO (Corporal) in February 1943, in Co. "B", 39th ITB, by Captain Robert A. Saxon, at that time he being the commanding officer of this battalion." "On March 7, 1943, I accompanied Bill Czok on the piano at the recital hall. I also played the violin during the 13 weeks of basic training." Joe could have said much more about his musical experiences. 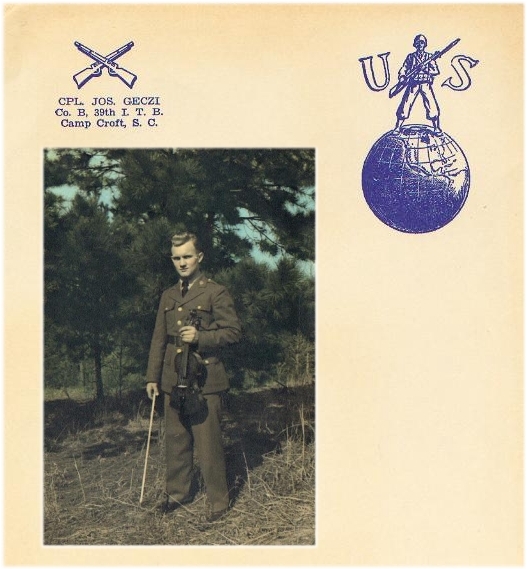 His interests are obvious when seeing the number of times he is pictured with a violin in his hands while at Camp Croft (the color tinted photo on the right is superimposed on Joe's personal stationary). 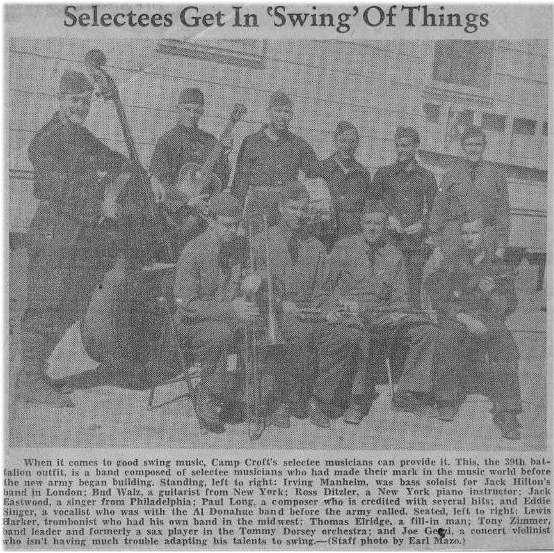 He was an accomplished violinist and played with a Swing group made up of other men from the 39th ITB (see article below). "During the summer of 1942, I received a letter from a 17 year old girl named Eleanor Jacob who was staying with Dr. & Mrs. Kondor in Trenton. In September, I has a three day military pass to Charlotte, North Carolina (the 70 mile limit on such passes) but somehow overrode the boundary and landed in Trenton, New Jersey. El and I met and became attracted to one another. During my Christmas furlough, I asked her to be my wife. I gave her a ring and we became engaged. The following year we were married on August 21st in St. Elizabeth RC Church in Carteret, where 19 years earlier her parents were married. I returned to Camp Croft after a 2 week honeymoon to Lutherland (now Pocono Lakes) in Pennsylvania and was placed on military alert because the Normandy Invasion plans were in "high gear" and we could be shipped overseas any day." "The following weeks were very suspenseful. Troops were leaving Camp Croft constantly, first to Fort Meade, Maryland and then to Camp Kilmer, and the Brooklyn Navy Yard and finally overseas. 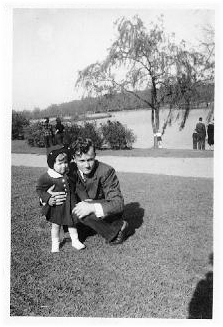 As autumn arrived, my brand new wife agreed to join me and she finally arrived in Spartanburg on November 11, 1943. W e enjoyed the bonus days and months and wondered whether Uncle Sam had forgotten about me. We enjoyed a terrific Thanksgiving dinner at the 39th Battalion ("B" Company) mess hall, but El was somewhat uneasy because she was the only gal there and all those potential wolves were eyeing her instead of the turkey on their plates." "We met a friendly couple that were both born in Germany, Ernie and Johanna Hormann. We enjoyed each other's company and went out to dinner a few times when the Army permitted it." They were also friends with Thomas and Mary Tomanello while at Croft. What was unique about the three couples is that the husband and wife in each instance was of the same nationality - Hungarian (Eleanor and Joe), German (Ernie and Johanna), and Italian (Thomas and Mary). "I was on winter maneuvers for 2 weeks before Christmas. Christmas Day we had to spend in our apartment because the roads were very icy and the buses weren't running between town and the camp. We missed a fine meal!" At the time they were living at 525 Woodland Avenue with Mr. and Mrs. Guy Gowan, who worked at the Spartanburg Lumber Company. "In early January we were examined at the base hospital and, of course, I was classified as available for overseas duty and placed on alert. During that time, our replacements were arriving from overseas very rapidly and the original training cadre was being shipped out. I took a 10 day furlough from May 1 - 10 and we both enjoyed it. We spent some time with my Godparents in Trenton (both his parents and grandmother has already passed away) and then with El's sisters in Carteret. I tried to relax a bit but a certain segment of my brain was overwhelmed with the enormity of the Normandy Invasion, which began this week, and what will or could happen with me once I am in the front lines. Realizing our days together were coming to an end, we went back to our little room on 525 Woodland Avenue in Spartanburg. My wife returned to Trenton and stayed with my Godmother while I was overseas." "That week became very historical because the Invasion of Fortress Europe had begun on Tuesday, June 6th, when thousands of young Americans, Canadian, British and a few volunteer from other countries landed in Normandy, France with plans to crush Hitler's German Army. Many thousands dies this week before a 'bridgehead' could be established and held. Thank God that my orders came after the "D" Day landings. I'm certain that many of those that I helped train for combat were in that invasion of Fortress Europe and God only knows how many were killed on the beaches." After arriving on the European Theater, Joe was assigned as a replacement squad leader for the 2nd Infantry Division, 9th Regiment, 2nd Battalion, “E” (Rifle) Company. When he reached the battlefield in France, he was a squad leader of 3rd squad, 3rd platoon, E Company. He was wounded on August 3, 1944 and was taken to England. By September 1, he was performing with Laughs, Inc. and spent the remainder of the war entertaining troops. He did not return from Europe until October 1945. Returning with his family to Trenton, New Jersey, Joe took a job at American Steel where he worked prior to being drafted into service. After two months, the family relocated to Carteret, NJ and built a home where Joe and his wife lived until 1980. After learning the electrical trade and working for a period of time with his father-in-law, Joe took a job at Westinghouse and later at Hyatt Roller Bearing where he retired in 1979. His daughter recalls him often coming home from a full day at work only to change clothes, grab his violin, and go out to play a wedding, party, or other small event with the Hungarian / American band he formed with at least four other musicians. Joe and his family made a trip back to Camp Croft in May 1955, a trip indicative of Joe's fond memories of life at the camp and his pride in serving his country. 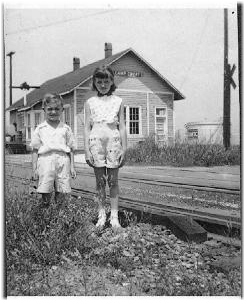 Just ten years after the war, little remained of many of the camp's 500+ buildings although the railroad depot still proclaimed "Camp Croft" when this photo of Joe's children, "Maddy and Ronnie," was made. A resident of Tom's River, NJ since 1980, Joe passed away on April 23, 2003. This group photo shows one of many platoons Cpl. Joe Geczi took through basic training, this particular one in June - July 1943. Even more notable is the fact that Joe took the time to record all the names of the men on the reverse of the photo. This same group, including the company officers and NCOs, signed a pledge to reunite, "God Willing," in Chicago three years later. It is not know if this reunion ever took place.